Throughout any given year, Oswegatchie will have many volunteer opportunities. It often will change with the season what we need or can accept. In Spring, we often need help prepping the grounds with rakes. In Sugar season, we need help with tapping trees and setting up lines. In Autumn, firewood and shutting down camp is a priority. We always need cleaners! Summer camp is the particular time of year where we need to be highly selective about who volunteers. With 180 campers onsite, we need volunteers who are checked, capable, and Oswegatchie savvy. During a full week there may be 250 people eating and sleeping on the property, so we may not have space. If you have a group, organization, or individual who would like to volunteer or earn community service hours, we may be able to help. All volunteers of 17 years of age or older, should be prepared to sign a "Volunteer Record, Release, and Risk Waiver". This document helps you and Oswegatchie track your time, but informs all parties of our responsibilities. For more info, please email us at info@oswegatchie.org or call (315) 346-1222. 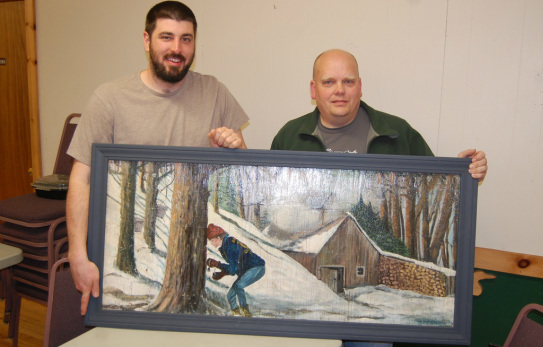 A volunteer took the time to seal and frame this iconic piece of Oswegatchie art. Does your Employer offer a volunteer program for helping in the community? Many progressive employers actually will pay you to volunteer in your community or with "Not for Profit" Companies. If you are interested in helping out at Oswegatchie or with the New York FFA, contact us to learn about opportunities. Sometimes just working a rake helps put us weeks ahead of schedule! Here are examples: Walmart in Your Community..., Hewlett Packard Employee Volunteers....., Volunteer Match!